In order to meet the huge market demands, we are involved in manufacturing and supplying best quality of Industrial Fastener. The offered Stainless Steel Duplex Fastener is offered by us to customers in various sizes. Further, the offered Stainless Steel Duplex Fastener is easy to use and available in bulk. We have gained a remarkable position in the market that is involved in offering POP Fastener. 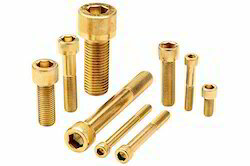 This Flat Brass Screw is used as an important fastener for affixing instrument parts.